The Public House is a local watering hole, with a focused beverage selection and a small, but refined menu of food. This logo was based on the idea of a small community pub, one with no televisions that encourages conversation. I used the white center-bar to reference subway/road signage, while at the same time hinting at a beer's foamy head. The bottom contains a halftone pattern to add depth while also simulating the carbonation in beer. This is the 2nd OZ Arts catalog I had the pleasure of designing. Highlighting a yearlong season of events, this catalog's goal was to reach mailboxes full of large color imagery and bold, modern design.. being fun to look at while providing all of the relevant information for the season of performances. I utilized a grid that provided spreads with over 60% imagery to highlight the performers. The mascot for a record company. I designed this with an old-school record shop in mind. The record album becomes a little man, screaming at you to buy more records! This invitation was designed to lighten the tension between students meeting professionals at a meet-and-greet to show off their portfolios. I chose the traditional "HELLO" sticker as the ice-breaker, switching up the letters to reflect the nervousness that comes with meeting other designers for possible employment. The printed OHELL sticker is attached to the poster with adhesive dots so the attendees can remove, and actually wear them to the meet-and-greet. Hopefully, all involved could laugh at themselves and have a fun takeaway as well. Several of many full page ads done for Cheekwood in Nashville, advertising upcoming or current exhibitions. I designed this logo and campaign for Room in the Inn in Nashville out of their want to highlight the population at RITI in a friendly way, while creating an emblem for people to feel connected to. The logo features the star from RITI's existing logo, and a new take on the roadside "hotel" sign, as seen in many of the signs along the streets of Nashville. 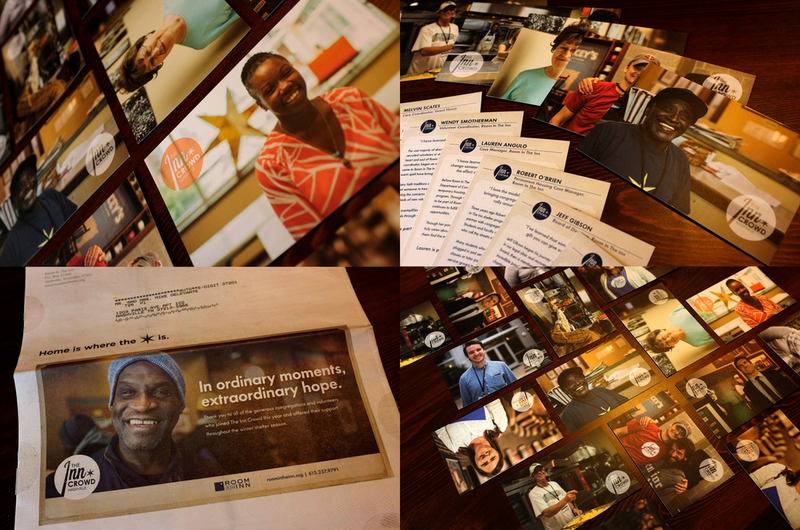 I also created postcards and ads highlighting success stories of individuals going through Room in the Inn's programs. Event graphics for the annual Upfront press event at Alice Tully Hall in New York. These banners, lightboxes, and posters are meant to highlight the talent on SNI's networks at the NY Upfront event. This is the largest of the 7-city Upfront schedule. Sample spreads from a redesign of the Scripps Networks style guide. This guide was designed to inform designers in our corporate communications department (and others, such as contract designers) of our newly refreshed design standards, from logo-usage to photo selection. This design guide was designed in tandem with a new corporate identity package (seen below). A gradual implementation of these changes was used in a successful rebrand of the entire company. Stationery redesign for Scripps Networks. This involved new business cards for everyone in the company, and letterhead, buckslips, mailing labels, folders, envelopes, and note cards for the domestic and international offices. A food truck featuring Vanilla Ice. This truck wrap design for a two-day event with the Food Network and DIY Network, where celebrities served deserts made on-site at a network-sponsored event. (Vanilla Ice was serving Whoopie Pies, which I found pretty hilarious). Large format posters designed for an exhibit highlighting 25 years of Knoxville band posters. These were designed on a Xerox machine and reproduced on a large format architectural printer (36" wide). Revamp of the V-roys debut album "Just Add Ice" for vinyl reissue. The original artwork was redesigned from CD to 12-ich tip-on sleeve. Original elements were used/improved upon for the larger format. CD package. Based on a photo shoot that took place in a seedy Knoxville motel, the printed CD itself being the curtain pattern from the hotel room. Tip-on sleeve, gatefold package for a 12" record and CD, using photos from the artist's family albums from the 1960s. Using original artwork by the artist's daughter, I edited and created new text for the artist name and title based on the original art (each letter is custom-made). I added the left side border to mimic the Golden Books from childhood memory to reinforce the family-feel of this recording. Pocket folder, brochure, and stationery package for Legacy Parks, Knoxville, TN. Business card design for a regional artist. Robin's work often uses collage and found objects, and she wanted a card that reflected the layering in her work. Type was created on an antique typewriter an scanned. Star hand-stamps were scanned as well, and placed on top of a worn paper texture. 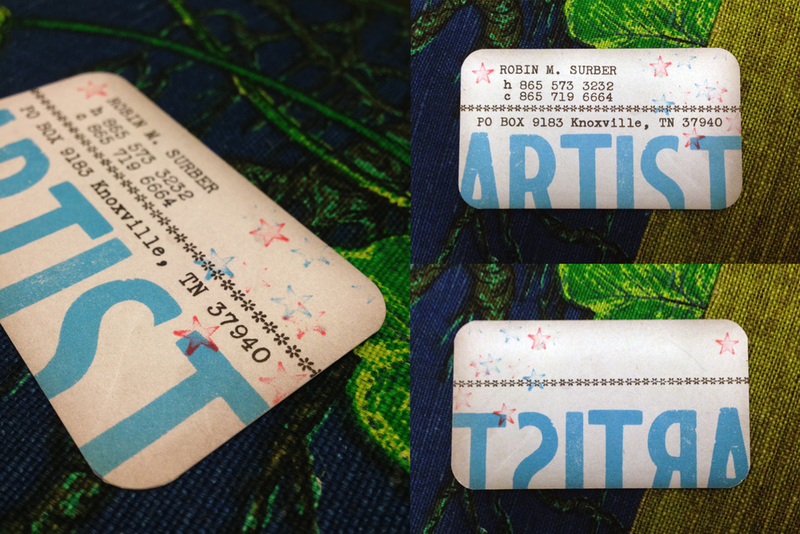 Wood block type was also scanned for the "Artist" type. Printed on extra thick stock.